Just How Do Muscles Help Bones? What Kind of Bones are There? As we saw last time, bones are amazing structures. They give our bodies shape, support, and protection. But were it not for joints, bones would eliminate our mobility. For every motion our bodies make, two muscles are needed- one to move it, and the other to return it. So, for example, to move the arm, we need the triceps muscle to extend it, and the bicep muscle to bring it back. Of course some bones are only protectors, like the skull. But it is significant that adults have over 600 muscles but only 206 bones. 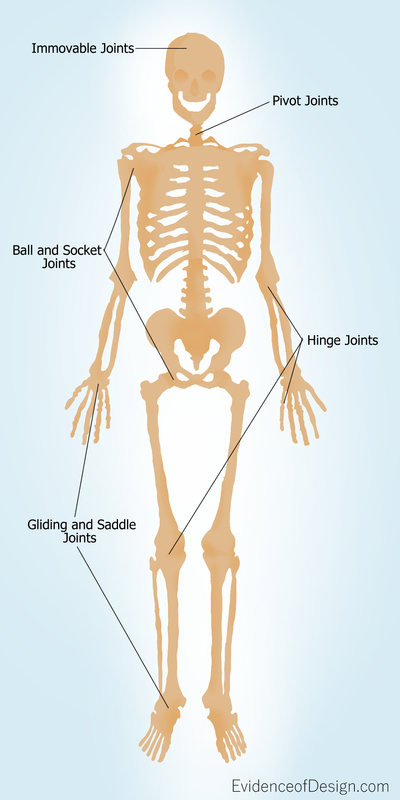 The body contains four different kinds of movable joints. The ball and socket joint at the shoulders and hips allow a great deal of motion in most every direction. The hinge joint allows motion in only one direction, as a door on a hinge. This is found in the elbows, knees, fingers and toes. If we had a ball and socket joint in these places instead of a hinge joint, we would either be much weaker, or we would need many more muscles to support these bones. The limited movement of the hinge joint gives us greater strength. The pivot joints found in the vertebra have decreasing freedom from the neck to the back. This means we can move our head from side to side but have greater strength in our back for support. Finally, gliding or saddle joints in the feet and hands allow us to move them up and down, back and forth. All the moving bones are held together by cartilage that is both strong and flexible. Of course, we also have immovable joints between the plates of the skull. A baby’s skull contains five separate plates that compress slightly to make childbirth easier. They also allow the growth of the brain but eventually fuse together, usually by age 2. Notice that from the shoulders and hips down, joints allow less and less freedom and bones provide increasing strength. There is an amazing parallel between these types of joints and God’s laws found in the Bible. The less freedom a law allows, the more important it is for the strength of an individual and a society. I commend you to search it out. Imagine the bone structure of a person evolving without joints, with the wrong types of joints, with immature joints, or without cartilage. This might end the human race before it got started! It is so much easier to believe our bones and joints were designed by a Master who knew just what we would need. Perhaps natural selection made it possible for these joints to exist, as u said if we had a ball and socket joint on our toes and fingers then we would be weaker, picture that scenario millions of years ago when we were evolving, such weaknesses would surely get you killed so that type of defects might have died out and thats how we now have our joints, because they are obsolete.